We all have favourite plants, some for their willingness to flourish where all else fails, others for fragrance, colour or association. I confess that I am fickle – I have favourites while they are in flower and then they return to the backdrop of the border until they shine again in twelve months’ time. My current delight is a bush of Caryopteris x clandonensis ‘Heavenly Blue’, now four years old and forming the most perfect rounded bush of greyish green leaves and deep blue, slightly whiskered flowers, attractive all day long to bees. An added bonus is its lavender scent in the sunshine. It is hardy, requires no special treatment or cosseting, a slight trim over in spring to remove any broken or dead stems and then off it goes. 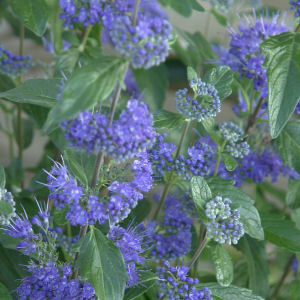 Mine is in a mixed border of ordinary slightly clayish garden soil, with full sun in summer and, beyond including it in the general feed and water routine, which is very little, it puts on growth and then, as the asters start to flower, so does the Caryopteris, and it will keep on going until the first frosts when I deadhead mine in preparation for winter. It can be easily raised from cuttings taken in July and August both as an insurance policy against winter losses and also to increase stock. Other cultivars are also available, including those with white, pale or darker flowers and golden foliage (‘Worcester Gold’). I am still deciding whether I actually like variegated foliage and golden leaves need to be placed very carefully. This year I added a further two Caryopteris to the border, backed by creamy yellow heleniums, russet rudbeckias, pale gold Stipa gigantea and purple asters. Once they reach the same size as the original plant the border will have more weight and substance as well as rhythm looking along it. I may even try it amongst roses on the other side of the garden, though as this area is a little more shaded it may not be so successful. It would also look ravishing as a low path edging instead of lavender or nepeta. I may just have to try it.